Naturally enough, numerous services have recently appeared allowing Net surfers to view search results on a map, bridging the gap between the ‘real world’ and Web content. No longer satisfied with viewing mappable information presented in an old-fashioned laundry list of search results, users today are hungry to search for information within and through a map. And Exalead is eager to join users in exploring the boundaries of map-based search. 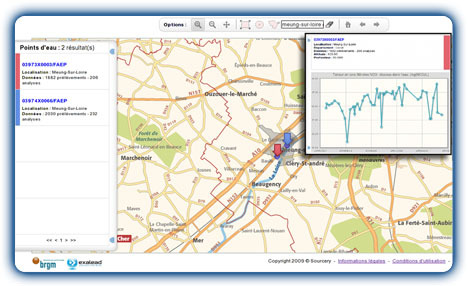 We’ve therefore added a new geo-spatial search demo, Sourcier, to our Exalabs site. Sourcier was produced in collaboration with France’s leading public earth science institution, BRGM (Bureau of Geological and Mining Research). 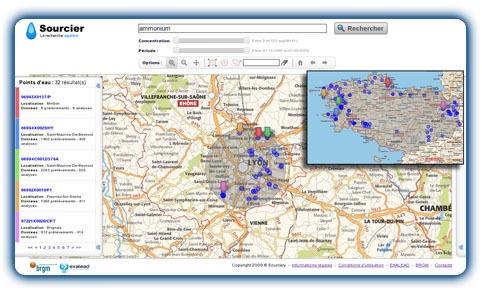 It provides map-centered search for metropolitan France groundwater resources using publicly available data from the ADES site. Results are displayed directly on the map along with markers for exploring related data in a graphical form. Forthcoming indexation and geo-search experiments using Exalead technology will involve support for more complex geometric objects and distance calculations to support extrapolation to different geometric shapes (for example, using a specified radius to manipulate maximum distance). 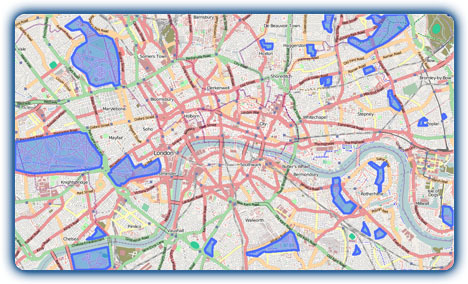 The indexation of geometric objects such as polygons would permit one, for example, to search London parks and reuse their geo-spatial ‘fingerprints’ on the map as search criteria, and to retrieve related Web data like geo-tagged photos or videos.